Dragon Quest Builders is a lot like Minecraft. Well, if Minecraft had actual objectives, a story, and a more enjoyable crafting system. That’s a better description of what this game is – Minecraft but better (to me). You take the role of a Builder – the only person left in the world who has the power to create items – and it is up to you to restore the light to all of these places. 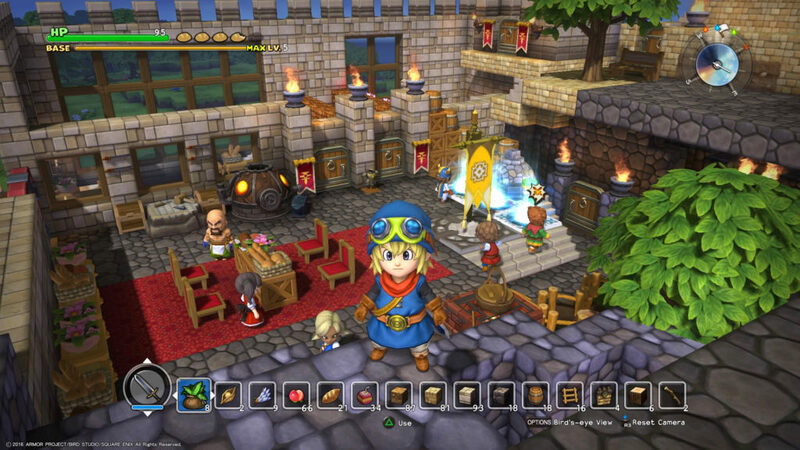 The story of Dragon Quest Builders, which is based on the world of Dragon Quest 1, is split up over four chapters, each one covering a town that you need to restore “to its former glory”. Within each of these chapters, you’ll be split up over a total of 4 different islands that you will explore until you make it to the boss at the end. Each chapter will have a focus on a different element of the game; for example, Chapter 1 is focused on teaching you the basics of the game, and Chapter 2 is focused on teaching you about how status ailments work. I did enjoy how each chapter was laid out, even if I did absolutely despise certain status ailments. When you reach the end of each chapter, you’ll have to face off with a boss. This boss is typically alluded to during your time working with the various NPCs who come to inhabit your village. Each of the four different boss fights features a different gimmick that you will need to use in order to win. For example, in Chapter 1 you need to use a special item called the “Cantlin Shield” in order to block the Golem’s boulders he tries to throw at your town. I wasn’t the biggest fan of how these boss fights worked, especially the ones in Chapters 2 and 3. I felt like they could’ve been handled a lot better than they were, but it was a nice touch that you needed to use the power of building in some way to make it through them. With how much combat becomes a part of Dragon Quest Builders, I was pretty disappointed to find out that the combat system was a bit lacking. It felt like there wasn’t much you could do besides “spam Triangle” and take the hits that the enemies throw at you. There’s no blocking or dodging in the game at all. I get that our character is “just a builder” and “not supposed to be a hero”, but something like blocking – especially when shields are an actual equipment piece – really would have been nice to have. The core mechanic of Dragon Quest Builders is the building parts. In order to restore the towns to the way they were before, you’ll need to build out different rooms using blocks that you find in the world. Villagers will sometimes also give you blueprints to follow – designs for rooms that need to be built in a specific way in order to match their request. An unfortunate side to this is that if there’s any blocks in the way of where you want to build then you won’t actually be able to place the blueprint there, unless they’re in EXACTLY the right place. This becomes somewhat annoying when all you’re really wanting to do is place a room next to another and not have a doubled up wall there. Luckily it’s pretty easy to fix this issue once you’ve completed the blueprint, since the villagers don’t actually care what happens to the room after you’ve finished it. Within each chapter there is also a set of 5 different challenges. These challenges will ask you to do specific things during the chapter, with one of them being a time-based one (complete the chapter within 20-30 days). Except for the one asking you to build up your base to a certain level, I didn’t actually do most of the others. There was one in Chapter 3 I did that was based off of a random blueprint I found in a chest, but for the most part these challenges will send you out hunting to find the required items, NPCs, or enemies in order to actually complete them. You also can’t actually see what challenges are in a chapter until you beat it, but this is only really relevant for the time-based ones since those are the only ones you actually have to replay a chapter to complete if you missed them. I did like the premise of the challenges though, I just wished that I could find out what they were before I had completed the chapter for the first time. Unlike in Minecraft, crafting in Dragon Quest Builders feels a fair bit easier to actually comprehend. One of the key parts is the fact that you don’t actually need to have the items on you, so you can just toss all of your crafting materials into chests and not have to hunt them down when you want to go make something. There are different crafting stations you need to go through so it can be a bit hard trying to determine which one your new recipe actually went to, but other than that I found the crafting to be fairly easy to use. 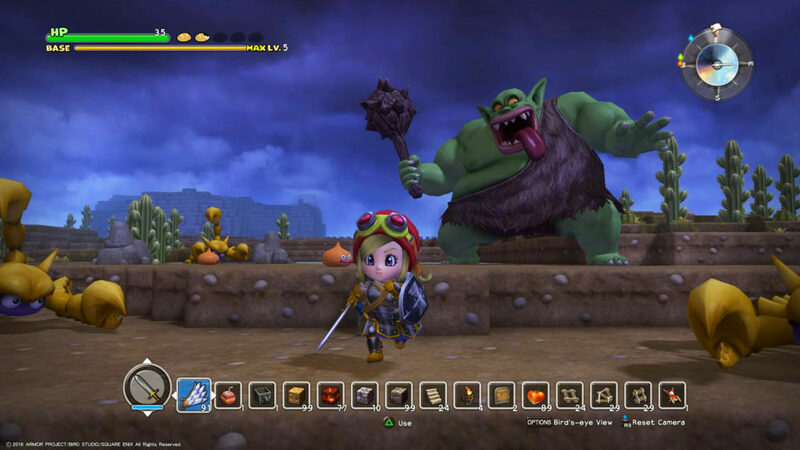 Dragon Quest Builders is an enjoyable experience that you definitely should not simply write off as a Minecraft clone. My main complaints about the game are mainly centered around the combat system, particularly the boss fights, and the fact the game is singleplayer only. These types of games are perfect for playing with someone else, and so the fact that I couldn’t play it with someone else was disappointing to me. If you’re a fan of this style of game already then I highly suggest picking it up, otherwise you should definitely consider grabbing it should you find it on sale. 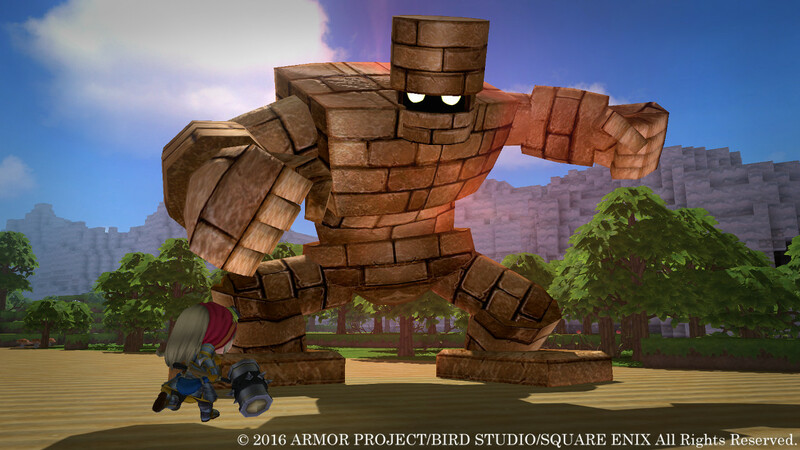 Dragon Quest Builders is available now through Amazon on PS4 and Vita. It’s also available via PSN for both systems.